Testimony: The Life and Work of David Friedman surveys the career of artist David Friedman (1893-1980), from his early days in Berlin to his late career in St. Louis, Mo. The exhibition includes portraits and landscapes as well as his powerful series Because They Were Jews!, a visual diary of his time in the Lodz Ghetto in Poland and his internment at the Nazi concentration camp of Auschwitz-Birkenau.Testimony is both an indictment of the horrors of the Holocaust and an affirmation of survival. This exhibition will be on display Jan. 25 through May 26. Testimony: The Life and Work of David Friedman, which surveys the artist’s long career, is a focus on his series Because They Were Jews!, a visual diary of his time in the Lodz Ghetto in Poland and his internment at the Nazi concentration camp of Auschwitz-Birkenau. Friedman(n) was born in Mährisch Ostrau, Austria (now Ostrava, Czech Republic), but moved to Berlin in 1911, where he studied under German impressionist Lovis Corinth. With the rise of Nazism, he and his family escaped to Prague in 1938, where he continued to paint for himself and sold artwork until 1941 when the family was deported to Lodz Ghetto. Most of the work from earlier in his career was lost, destroyed, or looted by Nazis. In 1944, Friedman was separated from his wife and daughter, never seeing them again, and was transferred to Auschwitz-Birkenau. Friedman survived his internment at the infamous concentration camp and married fellow survivor Hildegard Taussig. After living in Israel for five years, the family immigrated to the United States in 1954, eventually becoming citizens and settling in St. Louis, where he worked as a commercial artist for an advertising company, later retiring in 1962. 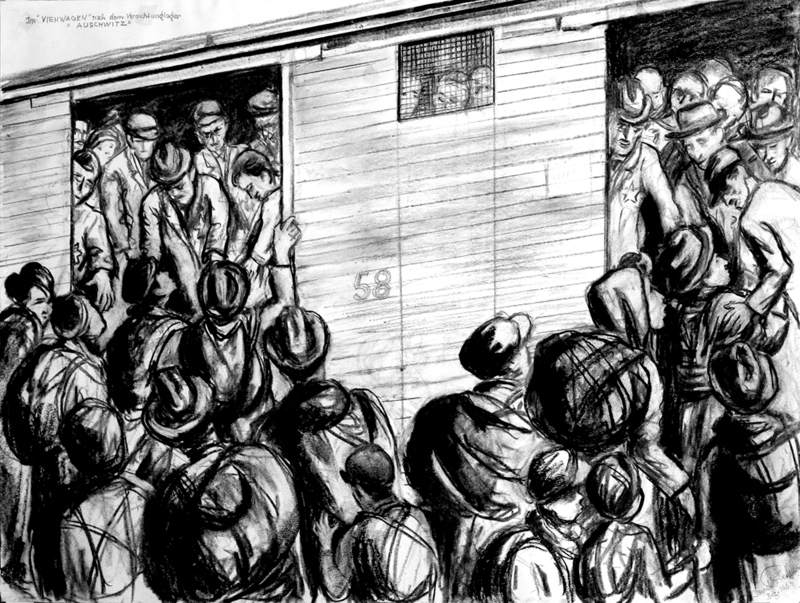 As a Holocaust survivor, Friedman found a new purpose in life to fight anti-Semitism and racial hatred by depicting the horrors he had witnessed and to show them to the world. Testimony offers a glimpse into the lifelong effects of the Holocaust, but also serves as an affirmation of survival. An event is scheduled on Feb. 28 featuring the artist’s daughter, Miriam Friedman Morris, and Lorne Richstone, associate professor of music at OU, will honor the legacy of Friedman’s work and will include musical excerpts from Jewish composers who were lost to the Holocaust. More information about these exhibitions and related programs is available on the museum’s website at www.ou.edu/fjjma. The Fred Jones Jr. Museum of Art is located in the OU Arts District on the corner of Elm Avenue and Boyd Street, at 555 Elm Ave., on the OU Norman campus. Admission to the museum is complimentary to all visitors, thanks to the generosity of the OU Office of the President and the OU Athletics Department. The museum is closed on Mondays. Information and accommodations are available by calling (405) 325-4938 or visiting www.ou.edu/fjjma.